This weekend is our second visit to Wales with RM. Half our group on own and half on hire bikes. Hire bikes perfect as is the gear provided. 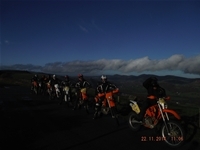 A fantastic days riding for all concerned. Had an absolutely ripping time, hard to duplicated. Rob and his team are totally attentive to your needs. The trails are chosen specifically to your experience , as your skill improve the more interesting trails are visited. Can only give them 10/10.....you can't score higher.....sorry Rob we're coming back mate. Can you thank your team from all of us.....great guys. Pete and I were amazed how Sean managed to fix Pete's Puncture at the top of a Hill?